Won't You Be My Nabor: Riffraff - "Let the Beauty of What You Love, Be What You Do"
Riffraff - "Let the Beauty of What You Love, Be What You Do"
Mike and I had a great time in NWA over the weekend! It was so good to see my BFF Ash, her husband Chad and of course her beautiful baby girl Avery!! We had a full weekend & did so many fun things! I will have to make a post or two this week to show everything we did. We took a ton of pics! We got back late tonight because Mike and I took our time getting out of town, shopped a little and then we also stopped in Little Rock to go to one of my favorite childhood restaurants. I wanted to do a quick post though and say hello to our friends at Riffraff. I have been following the blog and knew that was one of the places I wanted to go while I was in town for the weekend. I saw SO many things I was just dying to bring home! I wanted one of everything!! Since we are still getting settled in our house I was having a hard time thinking about what would go where. There was so many pieces in such amazing colors, but I couldn't think where I would want to put a piece of furniture or accessories since I'm still trying to figure out where our own things need go. I didn't leave empty handed though. I found a really neat pendant and so Mike got it for me. 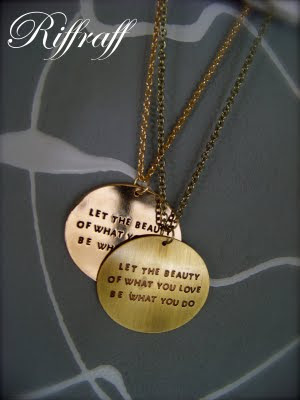 It's so cute and I love the saying on it, "Let the Beauty of What You Love, Be What You Do." I can also reverse it and where it on the other side without the quote. I am going to look around the house this week and think about what things and colors I may need in each room. I am hoping to go back in October and maybe by then I will have a better idea of everything and what it is I do really need. The owner of Riffraff, Kirsten Blowers was so sweet and I just loved her store. I was telling her how lucky she is to get to do what she loves every singe day. I could tell she truly loves her job and that is just awesome. Not many people can say that these days! She is definitely a perfect example of what the quote on the pendant means! So thank you Riffraff for your kindness and I can not wait to come back soon!!! I just LOVE this store!! Ash & I before lunch after some shopping . . . notice I am wearing my new necklace from Riffraff! Couldn't wait to wear it!! You are my new, most favorite person! I still haven't been to Riffraff but I plan to next time in Fayetteville!! You guys look so cute..love your dress!! Hey Lindsey, I found you through Ashley's blog and wanted to say Hi! Love the necklace you got and love Riffraff as well, it looks like they have some really cute stuff. It looks like you had some good fun on your trip...it is always so much fun to have some girl time with your best friends!